Light Weaponry: 2-.50 caliber; 2-.30 caliber machine guns, assorted small arms. Engines: 4-1,600 HP main engines. Motors: 4-685 HP motors, 2 per shaft, reduction gear drive. 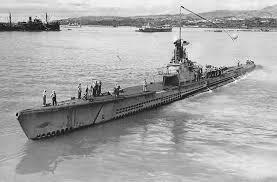 Wartime Modifications: Cut down bridge fairwater, gun armament upgraded, improved radar, sonar and electronics. Note: Some authorities consider the Gars to be a distinct class, separated from the Tambors by the two Mackerel class boats. Others consider them to be a part of the Tambor class, this latter group including the Navy’s official historians.